Boomer Lake is now officially within the arms of winter, but as the day progresses, it seems to go into hiding. In the early mornings, there is a bit of ice on the water that is truly a reminder that even though the seasons change, fall is still able to hold on as long as it can. Rumor has it that there is a good chance for a white Christmas, and you can bet that no matter how cold it is, I will be out there searching for our beautiful birds and how they are faring. Perhaps I will encounter some memorable moments, so do keep a watch for that. Our winter birds that are here now seem to be here for the season, and they have been providing some excellent opportunities for photos. 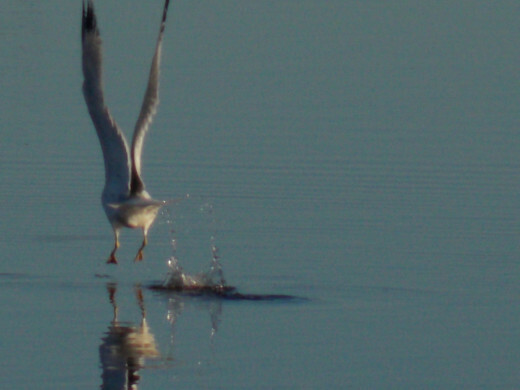 I caught a Ring-billed Gull sliding on the ice, doing all that it could to retain its balance. 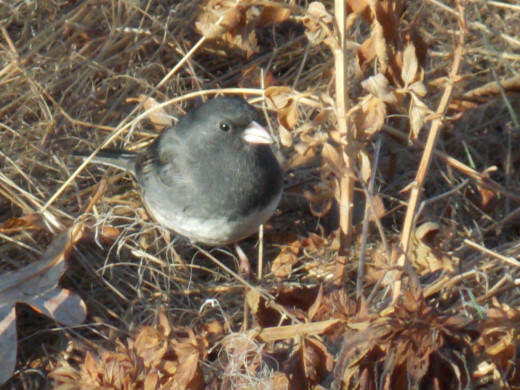 The sweet little Dark-eyed Juncos still have plenty of weed seeds to keep them well fed, and it is so enjoyable to hear them flying about as I am passing the east side of the lake. They are basically in the area of Swallow Scrub, for those of you that requested maps of the lake to refer to specific areas. The American Crows have been hanging around with the gulls, in the hopes that they will feed them. Chances are slim for that, and the crows move on, but they always seem to have hope nearly every day. 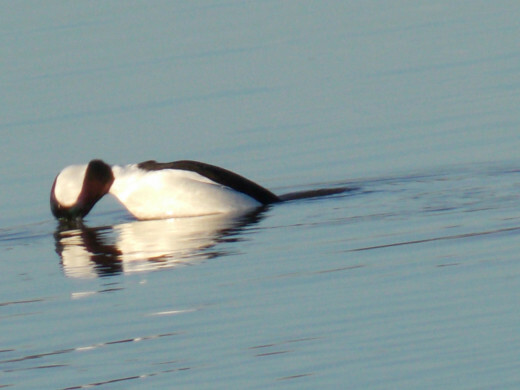 The Buffleheads are venturing closer to shore, and I got pretty decent pictures of a couple of males. 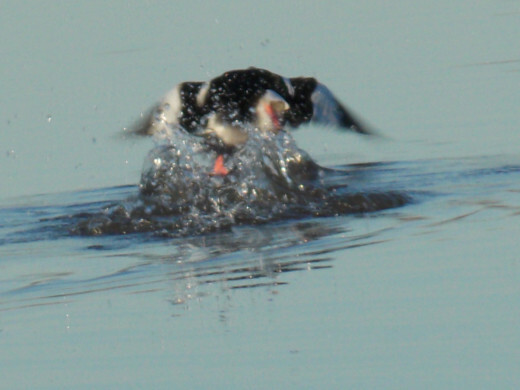 One was in the process of a dive, and another one was taking off from the water. The take off was definitely better than the one in last week’s edition. 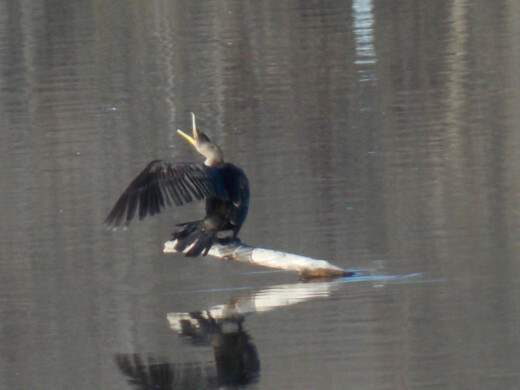 The Double-Crested Cormorants are still on the lake. A few of them also tend to stay around the gulls, but they generally stay to themselves. 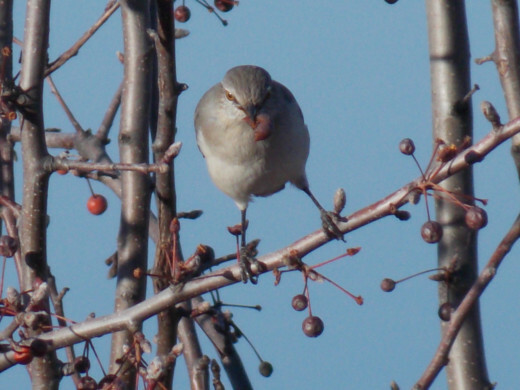 Our Northern Mockingbird has been eating berries from some of the trees and I captured a shot of him in action. The Great Blue Heron that tends to enjoy having his photo taken has been on the mainland for the past couple of days, behind Mockingbird Tree, as you can see here. Since the Southern Cove has been dry for a while now, he seems to prefer being around this tree. 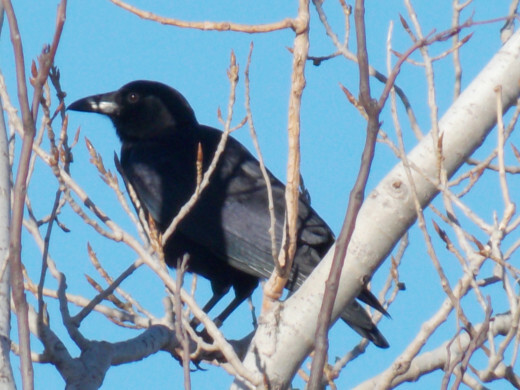 As you recall, I found him up in this tree a number of times, so perhaps he feels at home here for the winter. There is plenty of fish in the lake, mice in the area, so it all depends on how much cold he is willing to handle. I honestly can’t fathom him spending the entire winter here, but we shall see. 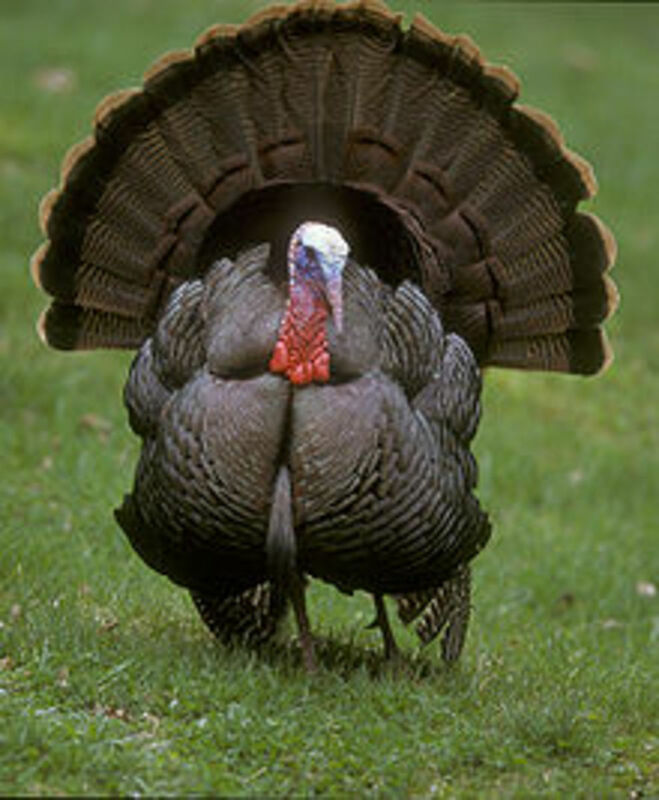 Is anyone still experiencing migratory birds in their areas, or has that traffic come to a screeching halt? Until next week, keep your eyes to the ground and your head in the clouds. Happy birding! And Merry Christmas to every bird, one and all! As always Deb you got such wonderful pictures of these amazing birds. Thanks for sharing the information about them. I am learning something about these birds. I always hear the mocking birds and it is nice to know something about them. Thanks again, Globetrekkermel. If I can ever get a good camera, THEN you will see some good shots. It will happen one day, but in the meantime, thanks for the support. always love your birds Deb, you really take good shots. happy new year to you. Oh, you know it, Suhail. I haven't seen any osprey here, but there were loads of them in Maine. 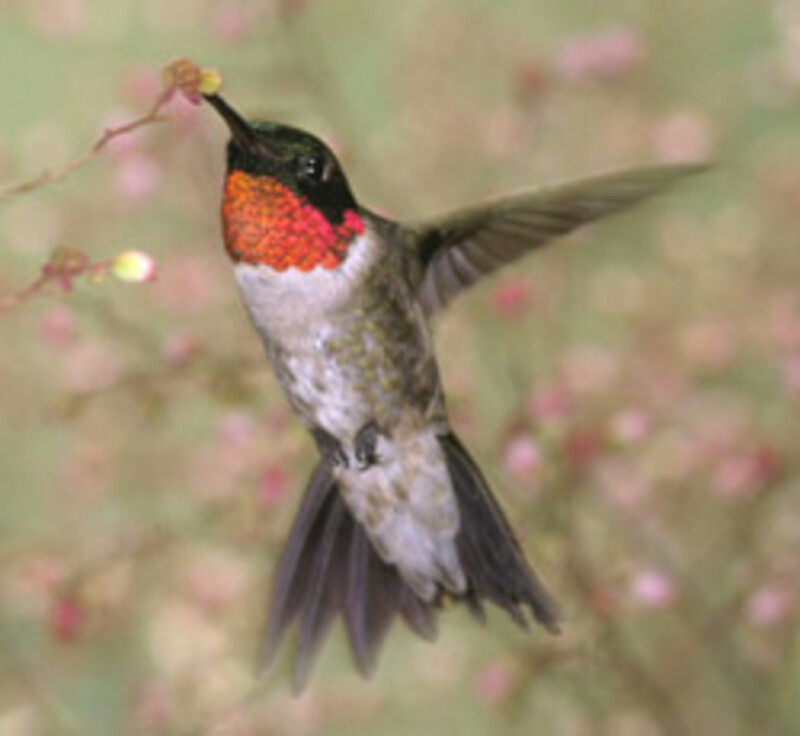 They used to nest atop telephone poles. Connie, it was so cold this morning, with the wind chills in the teens, AND I saw a NEW GULL!! Oh, I forgot to tell you, my piece on the cardinal is titled, The Northern Cardinal, A Cut Above the Crest. Thanks for all the support on my stories, I so appreciate it. The colder it gets, shiningirisheyes, the quieter the lake gets. Then the birds tend to come out more for me. You're welcome, Alicia. The Great Blue Heron was at the Lake today, as cold as it was. I'm still waiting for snow, Nettlemere. I think there was some on either side of us. I hope it shows up here, soon. I SO want to get snow scenes with the birds. Do you get sandhill cranes, golden eagles, ospreys and bald eagles in your region? I was wondering if your state is stealing them away from us in winters lol. Deb, you did an excellent job on this installment at Boomer Lake. 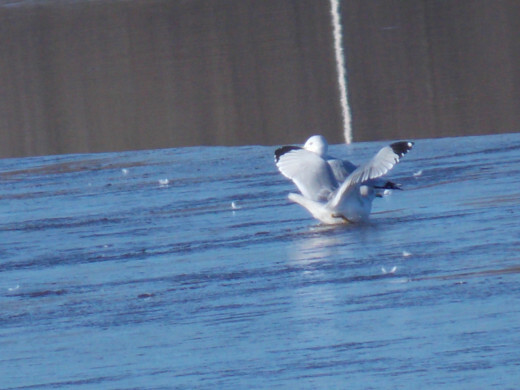 I love the gull sliding on the ice! 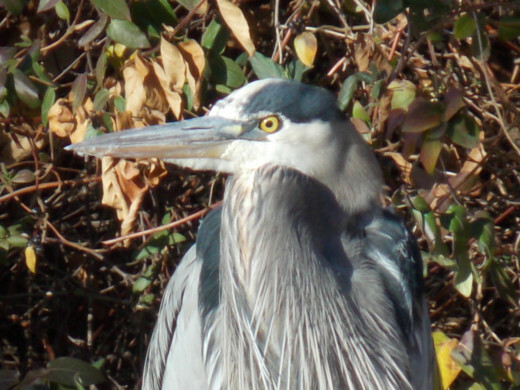 It will be interesting to see if the Great Blue Heron sticks around into January. 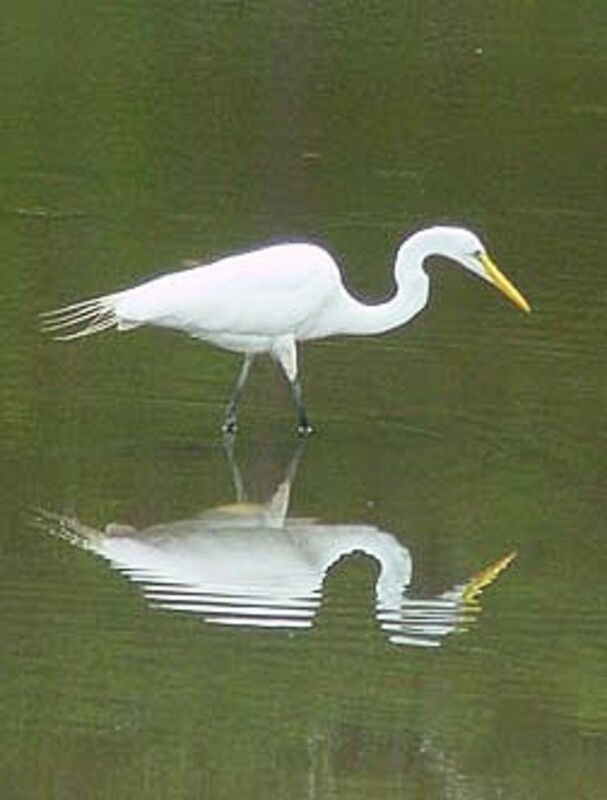 I haven't noticed any migratory birds lately at all. We do have snow on the ground, and the temperatures are in the low to mid 30's daily with lows overnight in the low 20's. I wish you luck in your area braving the cold to provide us with your wonderful pictures and information. Voted Up, Beautiful and Interesting! What a wonderful addition to your Boomer Lake series. I imagine the lake is beautiful on this quiet Christmas Eve. 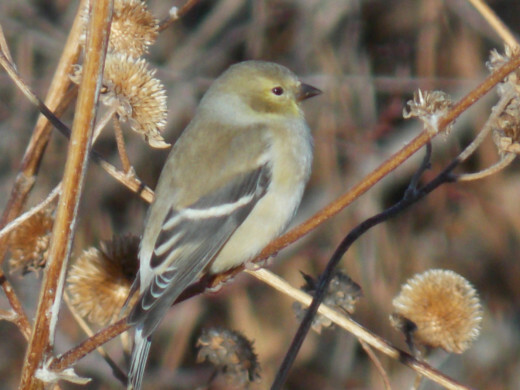 It's interesting to hear how the birds at Boomer lake are dealing with the winter. Thanks for the update and for another very enjoyable hub, Deb. We looked good for a white Christmas a fortnight ago with snow on the hills and lovely frost filled days, but instead we're getting a wet Christmas with floods! Wishing you a good Christmas at Boomer lake. I'm glad that Bev likes the lake, it is a great place. Bev loves Boomer Lake. :) I got her a bunch of bird stuff for Christmas. Good for you, Jim. I have two Coolpix, the latest is the L810. You made a good choice. Glad that you liked this edition, and I will see you next week. Thanks Deb for another great outing to Boomer Lake! The photos are great as usual. We bought each other a new camera for Christmas, a Nikon Coolpix P 510. 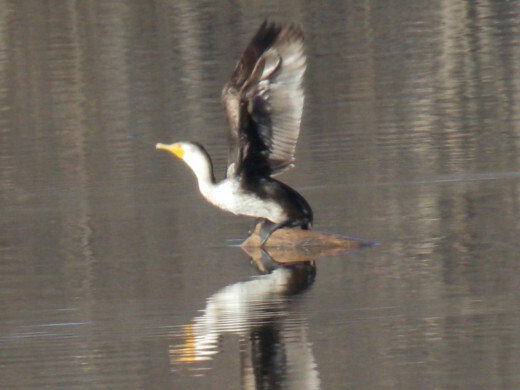 We just today tried it out at a new Delta ponds area I discovered, and the pics of a cormorant and some mallards and a Coot really came out great. It does not have an interchangeable lens but does go to 42x.